The students of Polk City Elementary School might live in a small city in Florida, but they know how to dream big. In March 2018, I visited the school and taught 43 kindergarten and second grade students the basics of creating plans for their city of 1,793. The city is currently seeking to improve its local economy and identify key community assets through a program funded by the Florida Department of Economic Opportunity. Working with these students was an opportunity to learn how they see their city and what they want to see in the future. I used APA Florida Chapter Kindergarten to Second Grade Guidebook and materials in both classes that meet Common Core Standards and facilitators guide. Although I was a little nervous, the activities went well and the students in both grades were excited and participated in the activity, especially when they had the opportunity to demonstrate their artistic skills. Second graders of Polk City Elementary creating their maps. Photo by Leny Huaman. 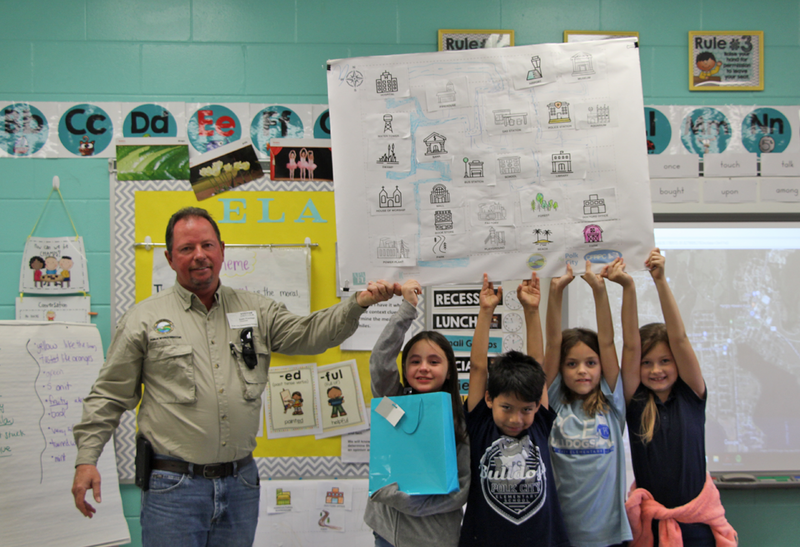 During the activity, the students recognized assets located within the city limits such as parks, public facilities, elementary school, and, most importantly, the Green Swamp. Although the activity was scheduled to last only 45 minutes, students enjoyed creating maps and talking about their city so much they didn’t want me to leave. At the beginning of the activity, children were divided into groups of four or five. I explained basic cardinal directions, how and why roads are built and asked what their favorite parks are. As newly appointed “Map Makers,” their first task was to color all the facilities and buildings that are in the city, then they organized based on their location, and finally, they created the roads that connected all buildings. Winning team presented best map award by Polk City Public Works Director Keith Prestage. Photo by Leny Huaman. The students enjoyed working in groups, and they all had lots of opinions and took pride in their city. Polk City Elementary students not only became map makers, they also became future planners. As an Ambassador, I was excited to work with children and to show them how exciting my career is. Although both activities required several hours of preparation, having the opportunity to see the pride the kids have in their city and their excitement as they created their maps was well worth it. To learn more about the APA Ambassadors program visit www.planning.org/ambassadors/ and follow #APAAmbassadors. Top image: The winning team shows its map at the end of the activity. Photo by Leny Huaman. Leny Huaman is a planner with the Central Florida Regional Planning Council that provides support to citizens and local governments in DeSoto, Hardee, Highlands, Okeechobee, and Polk Counties.